From The Spell of the Yukon by Robert Service. In continuing with the recent slide scan theme, this is one of my all time favorite images. Nothing fancy, but oh the memories! 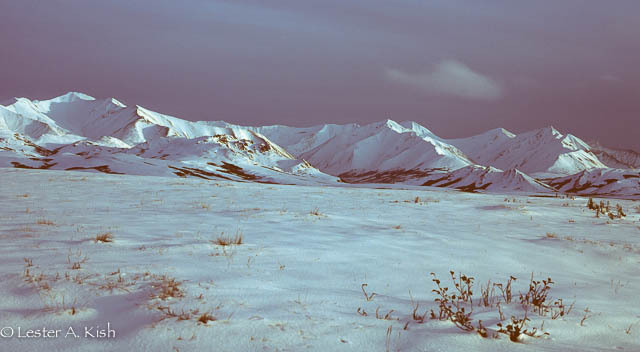 Twenty years ago my wife and I hunted the interior of Alaska. It was mid-September, and for all the world, could have been the middle of winter. The previous group of hunters had endured summer like conditions and biting flies. Conditions changed overnight. The landscape, now stark, was cloaked under a deep mantle of snow. We arrived in camp and were greeted by the outfitter and our native guides. One, an Athabaskan kid, guiding his first hunt, the other, an elder Inupiat who had guided many. Both were great characters, and a pleasure to share ten days afield. Looking at the image of those cold snowy mountains, I vividly remember what would become most exciting event in my life. That being, stalking a grizzly across a barren slope with the young guide in knee to thigh deep snow while my wife and the elder guide watched from the bottom of the mountain. I've been drawn back to the North Country many times since. Sometimes hunting. Mostly fishing and exploring. It is truly a great land. It really was a stunning place Bill. Yes, I have thought of framing it, but, my memories are so much more vivid than the image. Imagine stepping out of a wall tent, smelling the sweet smell of wood smoke and seeing the northern lights dancing over those snow covered peaks. As for conditions here...there's a winter storm warning out for most of Montana. Snow and cold are coming our way. The storm should make for tough travel later today and tomorrow. So, fishing is on hold for a while. No matter, there's a turkey waiting to be baked and pups to watch too. Les: Amazing picture above...great lighting. Also liked the cute pic of the pup in Why Wait post. Yes, why wait! Bob, as I recall, it was a late day shot. And, even though it looks like a cold scene, it had warmed up, relatively speaking. As for the pup, he's grown quite a bit. They'll be two weeks old tomorrow. Eye's are starting to open. Thanksgiving day was a breeze. I'm glad we did all of the cooking the day before.